One perfectly ordinary afternoon, a vision flashes through third-grader Hazel “Hazy” Bloom’s mind—of flying peas. The next day in the school cafeteria, a food fight erupts that involves the very same airborne veggie. After one or two more seemingly silly visions come true in unexpected ways, Hazy realizes she has a strange new power to foresee a visual clue about trouble that’s on its way within twenty-four hours. But seeing is not always understanding, and headstrong Hazy quickly discovers that “tomorrow power” sometimes only gives her the ability to make a hilarious mess of things instead of saving the day. Hazy Bloom loves her best friend, Elizabeth, but not her older brother Milo who is very annoying. Life is pretty ordinary until Hazy starts having 'visions', glimpses of the future that she doesn't understand. With the help of her BFSB (best friend since birth) Elizabeth, Hazy tries to figure out what these visions mean. When a 'vision' of flying peas turns into a food fight in the cafeteria the next day, and a 'vision' of a sparkly blue number 9 turns into saving a friend with an allergy from getting stung, Hazy and Elizabeth figure that she's got a super power. But as Hazy keeps seeing visions, she starts looking for fulfillment everywhere and begins getting herself in trouble with her teacher, her parents, and even Elizabeth. Hazy starts to wonder if having this ability is really a good thing or not. 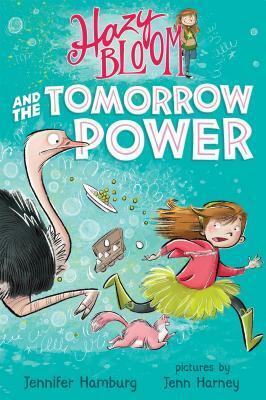 Hamburg and Harney have created a fun character with an unusual ability which makes for an amusing story that is a delight to read. This is one that I would read out loud to students who think that having a super power would be the best thing ever. I look forward to reading more about this character who distinctly reminds me of Sara Pennypacker's young Clementine.